This drawing is the preparatory sketch for 'Oriental Scenery,' part 5, plate 9. Opposite the town of Sultanganj, a sacred rock emerges dramatically from the river Ganges. It is covered with reliefs of Visnu, dating fom the 8th Century and other standing divinities. On the top there is a small temple as this is a place of pilgrimage. 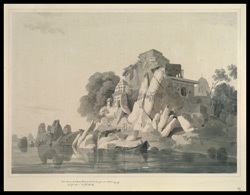 The Fakeer's Rock is one of the most sacred places of pilgrimage on the Ganges, as here was believed to be the residence of the hermit Jahnu who swallowed up the Ganges.